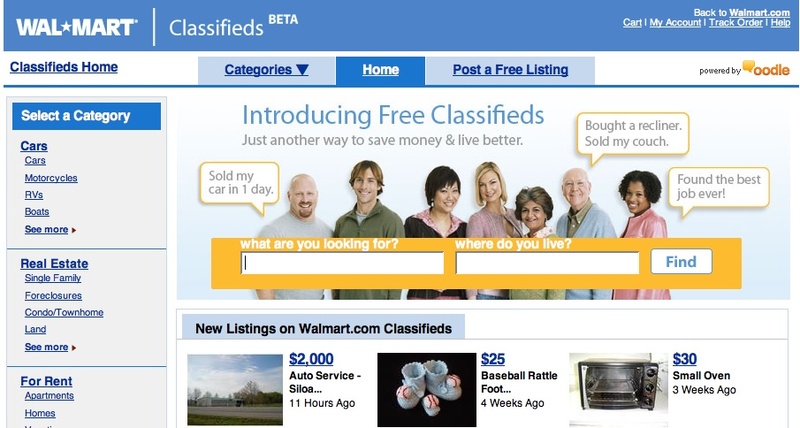 Wal-Mart Classifieds, Green Move or Consumerist Ploy?
. . . and wondered if Wal-Mart‘ s intentions are as pure as I was initially led to believe. I understand the idea is in beta testing, and they may not be ready to fully integrate it into their main site. Still, this begs the question of will they? If not, they are lending their name to lure in the classifieds crowd to their main site, where of course, it is all about consuming, consuming, consuming. For now, I am sticking to Craigslist, where citizens rule! My mind still fresh from the recent media frenzy around rising gas prices, and still pondering what to do about James Hansen‘s call to action, I was not about to let this one go. And went on the Energy Tomorrow‘s website, for more. As I browsed through the site, I couldn’t help but think, boy these guys are good! The Big Oil guys are masters at twisting the truth, and washing their dirty secrets into bright green. That they are swimming in cash does not hurt either. Slick campaigns, slick website, great copy, seductive images, multimedia blitz, nothing is spared. Of course, the first step is to expose their lies to as many people as possible, as in writing this post for instance. Next is to take concrete action, to get at them where it hurts the most, in this case the value of their companies. This is where it gets very interesting. 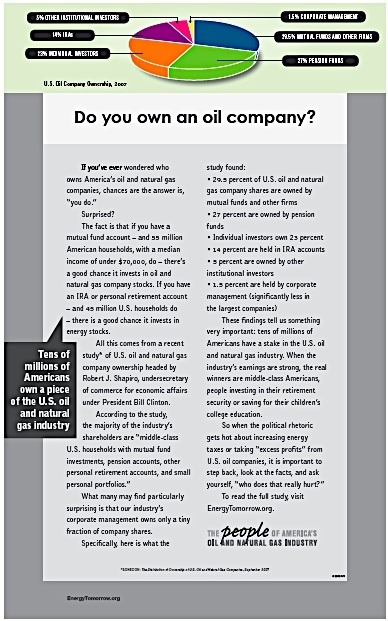 Those tens of millions of Americans with a stake in the oil and natural gas industry, that the ad talks to, . . . imagine a campaign asking them to switch to ‘less risky stocks’, stocks that bank on the bright future of renewable energies for instance. Earth Day is approaching, and with it, waves of unease in the blogosphere. Echoing one of my earlier posts, ‘Green Festival or Celebration of Green Consumption?‘, an article in Ad Age this morning, raises the question of ‘Is Earth Day the New Christmas?‘. Consumerism pervades our entire culture, we know that. And Earth Day is not exception. In the absence, still, of strict FTC guidelines, marketers are going to go wild with greenwashing on April 22nd. Newsweek, Target, Banana Republic, Macy’s, Toys’R’Us, Sweet Leaf Tea, Fairmont Hotels, Barbie dolls, Wal-Mart, Clorox, are amongst some of the companies that will ‘celebrate’ green, according to the Ad Age article. I say, we go back to the original spirit of Earth Day, and we use the day as another ‘no shopping day‘ instead. Will you join me? All green marketers would do well to take note of Nielsen Online‘s new report just mentioned in Ad Age this morning. According to Jessica Hogue, research director at Nielsen Online, and author of the report, “Corporations can’t do everything in one feel swoop, but need to be authentic and transparent about the steps they are taking,” She also suggests brands, study Footprint Chronicles, Patagonia‘s recent interactive online campaign, that discloses the company’s both environmental good works and sins. It’s time brands understand that they are in a relationship with their citizen customers.